Background: In saliva, neutrophil constitutes the most prominent first-line defense of immune cells against pathogenic microbes. The importance of neutrophils to the host immune systems of neutropenic or patients disabled with regard to their neutrophil function results in a tendency toward serious infections, such as early childhood caries (ECC). The cytoplasmic granules present in neutrophils play a major role in neutrophil-mediated inflammation. Azurophilic granules contain antimicrobial proteins, such as defensin, a human antimicrobial peptide (HNP 1–3). The aim of this study is to analyze the correlation of HNP 1–3 secretion with CD63 expression on the surface of salivary neutrophils. Materials and Methods: This study constituted a cross-sectional, analytical observational study. Saliva taken from preschoolchildren between the ages of 4–6 years who had been divided into two groups, i.e., early childhood caries group with decayed, extracted, filled teeth (def-t) index >6 and caries free with def-t = 0, was subjected to a HNP 1–3 secretion test using ELISA assay and an expression test for CD63 by means of a flow cytometry test. The results obtained were analyzed using independent t-test and Pearson correlation (P < 0.05). Results: The secretion of HNP 1–3 in the saliva of ECC was higher (172.6 ± 41.64) compared to that of caries-free cases (140.39 ± 31.91), whereas the level of CD63 salivary expression in ECC was lower (2.32 ± 0.57) than in the presence of caries (2.67 ± 0.46). Conclusion: In ECC cases, saliva increases HNP 1–3 secretion but decreases CD63 expression on the surface of salivary neutrophils. Tooth caries is a chronic disease possibly afflicting the erupted teeth of preschool-age children, which can cause pain and even death. Streptococcus mutans is a cariogenic bacterium and a predominant etiological factor in the incidence of tooth caries, which is found in large quantities in biofilm environments. Causality between the incidence of caries and the substantial number of S. mutans has been demonstrated by several studies confirming caries development to have been preceded by S. mutans colonization, while others suggested that salivary levels of S. mutans are an indication of caries progressivity, as confirmed by Luthfi et al. who showed that S. mutans level in caries-free children is lower than those in caries children with decayed, extracted, filled-teeth (def-t) index >6. In saliva, neutrophil is the prominent first-line defense of immune cells against pathogen microbes, which is proven by the identification of several severe diseases in human due to the dysfunction of neutrophil or due to the disturbance of its level as found in neutropenia cases. Neutrophil, as a defense against the inflammation mediator secreted by the microbes, performs chemotaxis and phagocytosis and eliminates the microbes by releasing human antimicrobial peptides (AMPs) (HNP 1–3) as nonoxidative antibacterial mechanism. Neutrophil consists of three main granules and azurophilic being one of those which contains HNP 1–3 secreted in saliva from gingival crevicular fluid as antimicrobial defensin. HNP 1–3 has a protective role against oral pathogen microbes by controlling the biofilm formation, which effectively prevents the occurrence of oral infection and defending the tooth structure against caries. HNP 1–3 secretion occurs as the consequence of neutrophil activation that leads to the degranulation of azurophilic granules which can be detected in CD63 markers on the surface of neutrophil. CD63 is a membrane protein largely found in azurophilic granules which plays a role in controlling the quality of antimicrobial protein. To gain additional information from this perspective, the correlation between CD63 expressions on the surface of salivary neutrophil with HNP 1–3 secretion in early childhood caries (ECC) was analyzed. This research represented a cross-sectional, analytical observational study conducted on healthy, preschool-age children both male and female aged between 4 and 6 years with or without caries. The exclusion criteria of this research were children with or without caries below 4 years and above 6 years, children with blood and saliva disorders, children under antibiotic and corticosteroid medication which can suppress immune response, and children with erupted permanent teeth. This research was approved by the Ethical Committee of Universitas Airlangga with Laic Ethic No. 01/KKEPK/VII/2013. Informed parental consent was acquired before the sampling being conducted. This study incorporated the use of random sampling of 4–6-year-old students from four Surabaya-based kindergartens. This age group was selected considering their caries-susceptible condition as the immune response functions have not been optimal yet in eliminating pathogen microorganism, resulting in the high prevalence of caries. Assessments of the dental caries were conducted in forty students by one dentist using disposable mouth mirrors for indirect vision and torchlight and performed by measuring the def-t. Dental explorer was used to confirm visual evidence of caries on the teeth surfaces. During the examination, the children were seated on a chair, across the examiner and two assistants, who sit close to the examiner to record the data and prepare the equipment. The participants were subsequently divided into two groups based on the def-t index: a caries-free group (def-t = 0) and an ECC group (def-t ≥ 6). Salivary neutrophils were obtained from participants by rinsing their oral cavities with 10 mL of sterile and 1.5% NaCl solution while they gargled without swallowing for 30 s before expectorating the resulting fluid into a sterile glass – a procedure repeated four times. The collected solution was centrifuged (15 min at 450 g) at 4°C and the pellets then mixed with 2 mL of Roswell Park Memorial Institute medium. An EasySep™ Human Neutrophil Enrichment Kit (STEMCELL Singapore PTE Ltd., Singapore) was used to isolate salivary neutrophils. Cell suspension with a concentration of 5 × 107 cells/mL was placed in 5 mL (12 mm × 75 mm) polystyrene round-bottom tube with 50 μL/ml of EasySep® neutrophil cell cocktail subsequently being added. The resulting mixture was incubated at 4°C for 10 min. Three Mix EasySep® nanoparticles were then used by pipetting up and down more than five times. Thereafter, 2 mL of cells was added to 200 μL of nanoparticles, mixed, and incubated at 4°C for 10 min. 2.5 mL of the cell suspension was then placed in the tube (without a cap) with a magnet, mixed, and incubated for 5 min at room temperature. At the next stage, the EasySep® magnet was removed in one continuous motion. The tube remained inverted for 2–3 s before being returned to the upright position. The empty tube was subsequently removed from the EasySep® magnet, replaced with a new tube containing supernatant fraction, placed on the magnet, and left to stand for 5 min. Isolated cells in the new tube were, at that point, ready for use. Saliva samples were analyzed using an ELISA kit (Hycult Biotech, Uden, Netherlands) to determine the extent of HNP 1–3 secretion. Samples were diluted at least five times with sample dilution buffer in polypropylene tubes. About 100 μL of duplicate standard and samples were added to the well, covered, and incubated for 1 h at room temperature. The plates were then washed four times with a wash buffer using a plate washer. About 100 μL of diluted tracer was added to each well, covered, incubated for 1 h at room temperature, and washed four times. About 100 μL of diluted streptavidin–peroxidase was added to each well, with the tray being subsequently covered, incubated for 1 h at room temperature, and washed four times. About 100 μL of TMB substrate was added to each well, with the tray being subsequently covered, incubated for 30 min at room temperature, and covered again with aluminum foil. About 100 μl of stop solution was added to stop the reaction with the solutions in the wells being thoroughly mixed by gently swirling the plate. The plate was read within 30 min after the addition of stop solution at 450 nm using a plate reader. Isolated cell suspension from the NaCL 1.5% rinse was inserted into the microtube containing 500 μl of phosphate buffered saline (PBS), before being centrifuged at 2500 rpm for 5 min at 4°C. Acquired pellets were then stained using 50 μl of conjugated BioLegend antihuman α-CD63FITC, and BioLegend α-PIPE (BioLegend, San Diego, USA) conjugated antibodies at a ratio of 1:200 to PBS. Stained cells were stored at a temperature of 4°C for 30 min before the suspension was added to 1 ml of PBS and recentrifuged for 5 min. About 100 μl of BioLegend Cytofix Cytoperm (BioLegend, San Diego, USA) was added to the pellets and homogenized. After incubation in a darkened environment at 4°C for 20 min, 1 ml BioLegend Washperm 1X (BioLegend, San Diego, USA) was added and the suspension was recentrifuged at 2500 rpm for 5 min. With the addition of conjugated BD antihuman α-CD64PerCP (Becton Dickinson, New Jersey, USA) as an intracellular antibody in the pellets, the suspension was placed into a flow cytometry cuvette with 300 μl PBS which was then attached to the nozzle to be analyzed by means of an FACSCalibur flow cytometer BD (BioSciences, San Jose, USA). The neutrophil gate was identified by density and size using side-angle light scatter followed by forward-angle light scatter. This compensation was reached by means of fluorescein isothiocyanate (FITC) and phycoerythrin (PE) labeled with individual antibodies. The results were presented as mean fluorescence intensity and analyzed using FACSCalibur (Becton Dickinson, New Jersey, USA) with a program, CellQuest software. The results were listed as the mean ± standard deviation. All statistical analyses were performed using SPSS 20 (IBM, New York, USA). The statistical difference was analyzed by t-test. Correlation analyses were performed using Pearson correlation with P < 0.05 being considered to be significant. CD63 expression was detected using flow cytometry [Figure 1]. Both salivary HNP 1–3 level and activated salivary neutrophil (CD64) which expressed CD63 were analyzed using t-test and showed a significant difference in HNP 1–3 level between the caries-free group and the ECC group as shown in [Table 1] and [Table 2]. 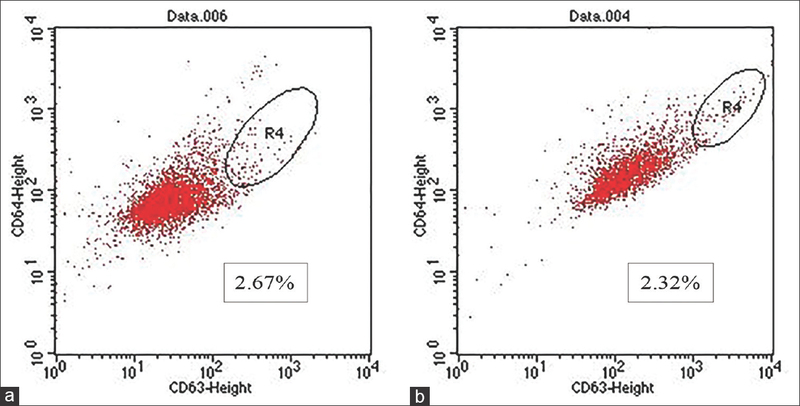 Figure 1: Activated salivary neutrophils (CD64), which expressed CD63 in saliva, detected by flow cytometry in preschool-age children who were caries free (a) and with early childhood caries (b). The correlation between CD63 expression in the salivary neutrophil surface and HNP 1–3 secretion in the saliva of caries-free children is found to be stronger than their correlation in ECC children as shown in [Table 3]. Saliva is an important element in the prevention of caries. Salivary proteins have a potential role in inhibiting caries development as a result of the AMPs, such as HNP 1–3, human β-defensins 1–3, cathelicidin (LL-37), and histatin, which it contains. These peptides demonstrate broad-spectrum antimicrobial activity and are derived from several sources, including salivary gland acini and ducts, oral mucosa epithelial, and neutrophils. In the oral cavity, defensin and LL-37 have considerable potential to inhibit various strains of bacteria, while histatin acts as an antifungal agent. Microbial infection in oral mucosa induces an extensive number of AMPs, including defensin, which does not merely act as antibiotics but also carries out immunomodulatory activity ranging from the innate to the adaptive. Innate immunity is the primary defense system against the infection by detecting the component of the microbes, such as LTA, which is found in the cell wall S. mutans, through toll-like receptors. This leads to the activation of complex cell signaling network and results in the production of various effector molecules, including HNP 1–3, which regulates the host immune response. HNP 1–3 can increase the innate immunity by stimulating pro-inflammatory response through increasing the mobilization of neutrophil to the infection area, generating reactive oxygen species, facilitating the phagocytosis process, and inducing pro-inflammatory cytokine. This research confirmed that HNP 1–3 levels in ECC were higher than those in caries-free situations. This finding challenged the study conducted by Tao et al. which stated that salivary HNP 1–3 levels in children with active caries are proven to be lower than those in their caries-free counterparts. This difference was possibly due to the age range of the participants observed by Tao et al. being approximately 11–15 years since different age groups would present contrasting immune response maturity levels. Age variation plays an important role in immune response regulation. Children and the elderly are more prone to infection than other age groups. Immune cells in adults showed a stable state in protein serum. As this research was conducted in Indonesia while that of Tao et al. was carried out in the USA, it was undoubtedly that a different genetic and demography environment would affect the immune response maturity of each individual. Genetic factors known to be predisposing factors of infection, for instance, immunodeficiency manifestation are possibly caused by an heredity-specific immune system. Environmental factors also play a role in affecting the development and regulation of the immune system. The high level of HNP 1–3 in ECC demonstrated that it could not protect the host from S. mutans virulence, probably because the cariogenicity of the S. mutans strain contained in the saliva of ECC was more pronounced than in the caries-free research participants. To induce an infection, bacteria must demonstrate resistance to AMP, as found in S. mutans. S. mutans is Gram-positive bacteria which could inhibit the intrusion of HNP 1–3 as its cell wall consists of a thick peptidoglycan crosslinking with LTA polymer, to prevent the AMP activation. Neutrophil consists of three main granules which act as nonoxidative antimicrobials: primary granules (azurophilic granules), secondary granules (specific granules), and cytoplasmic antimicrobial protein. Antimicrobial substances found in primary granules include: defensin (known as HNP 1–3), elastase, collagenase, proteinase, myeloperoxidase, lysozyme, bacterial permeability factor, and cathepsins. Secondary granule proteins include lysozyme, lactoferrin, and collagenase. These granules interact with phagocytic vesicles resulting in the release of its contents into phagosomes with engulfed microbes. Neutrophil is the first innate immunity cell to be found in the infection site as a response to the pathogen microbes. This cell was recruited to opsonize the bacteria through Fc-gamma receptors and C-type, which results in phagosome formation and the release of various antimicrobial proteins and intracellular enzymes. Based on the results of this study, the expression level of CD63 in ECC children was found to be lower than that in caries-free children. This could happen because S. mutans is internalized by neutrophils through a phagocytosis process mediated by FcαR (CD89) or CR1 (CD35) which facilitates the development of three defense mechanism strategies to avoid being phagocytosed. These include escaping from host phagosome, blocking the phagosome-lysosome fusion, and promoting some form of mechanism which allows itself to live in the phagolysosomes. There is a reverse correlation between HNP 1–3 secretion in saliva and CD63 expression on the surface of salivary neutrophil of ECC children proven by the increase of HNP 1–3 secretion, while the expression of CD63 was found to decrease. This finding could be used to develop a potential early detection assessment of caries risk in children to advance the caries prevention strategies in the Southeast Asia population. The authors would like to thank Prof. Muhaimin Rifa'i, PhD. Med. Sc for the help in conducting this research. The authors would like to thank Directorate of Research and Community Services of Directorate General of Research and Development Strengthening from Ministry of Research, Technology and Higher Education of the Republic of Indonesia for the grant funding provided for this research. Tanzer JM, Livingston J, Thompson AM. The microbiology of primary dental caries in humans. J Dent Educ 2001;65:1028-37. Luthfi M, Indrawati R, Arundina I, Dachlan YP. Korelasi Jumlah Streptococcus mutans (S. mutans) dan level ekspresi interlukin 8 (IL-8) pada severe early childhood caries. Maj Ked Gi Ind 2015;1:142-8. Nauseef WM, Clark RA. Granulocytic phagocytes. In: Mandell GL, Bennett JE, Dolin R, editors. Mandell, Douglas, and Bennett's Principles and Practice of Infectious Disease. 7th ed. New York: Elsevier/Churchill Livingsone; 2010. p. 93-117. Miles K, Clarke DJ, Lu W, Sibinska Z, Beaumont PE, Davidson DJ, et al. Dying and necrotic neutrophils are anti-inflammatory secondary to the release of alpha-defensins. J Immunol 2009;183:2122-32. Ashby M, Petkova A, Hilpert K. Cationic antimicrobial peptides as potential new therapeutic agents in neonates and children: A review. Curr Opin Infect Dis 2014;27:258-67. Khurshid Z, Naseem M, Sheikh Z, Najeeb S, Shahab S, Zafar MS, et al. Oral antimicrobial peptides: Types and role in the oral cavity. Saudi Pharm J 2016;24:515-24. Pols MS, Klumperman J. Trafficking and function of the tetraspanin CD63. Exp Cell Res 2009;315:1584-92. Bartie KL, Devine DA, Wilson MJ, Lewis MA.In vitro susceptibility of the Streptococcus milleri group to antimicrobial peptides. Int Endod J 2008;41:586-92. Beighton D. The complex oral microflora of high-risk individuals and groups and its role in the caries process. Community Dent Oral Epidemiol 2005;33:248-55. Thaiss CA, Levy M, Itav S, Elinav E. Integration of innate immune signaling. Trends Immunol 2016;37:84-101. Choi KY, Chow LN, Mookherjee N. Cationic host defence peptides: Multifaceted role in immune modulation and inflammation. J Innate Immun 2012;4:361-70. Tao R, Jurevic RJ, Coulton KK, Tsutsui MT, Roberts MC, Kimball JR, et al. Salivary antimicrobial peptide expression and dental caries experience in children. Antimicrob Agents Chemother 2005;49:3883-8. Carr EJ, Dooley J, Garcia-Perez JE, Lagou V, Lee JC, Wouters C, et al. The cellular composition of the human immune system is shaped by age and cohabitation. Nat Immunol 2016;17:461-8. Kochi Y. Genetics of autoimmune diseases: Perspectives from genome-wide association studies. Int Immunol 2016;28:155-61. Anwar A, Shah MR, Muhammad SP, Afridi S, Ali K. Thio-pyridinium capped silver nanoparticle based supramolecular recognition of Cu (I) in real samples and T-lymphocytes. New J Chem 2016;40:6480-6. Guilhelmelli F, Vilela N, Albuquerque P, Derengowski Lda S, Silva-Pereira I, Kyaw CM, et al. Antibiotic development challenges: The various mechanisms of action of antimicrobial peptides and of bacterial resistance. Front Microbiol 2013;4:353. Delima AJ, Van Dyke TE. Origin and function of the cellular components in gingival crevice fluid. Periodontol 2000 2003;31:55-76. Skubitz K. Neutrophilic leukocytes. In: Greer J, Arber D, Glader B, List A, Means R, Paraskevas F, et al., editors. Wintrobe's Clinical Hematology. 13th ed. Philadelphia: Lippincott Williams and Wilkins; 2014. p. 125-59. Nordenfelt P, Tapper H. Phagosome dynamics during phagocytosis by neutrophils. J Leukoc Biol 2011;90:271-84. Rosenberger CM, Finlay BB. Phagocyte sabotage: Disruption of macrophage signalling by bacterial pathogens. Nat Rev Mol Cell Biol 2003;4:385-96. Beertsen W, Willenborg M, Everts V, Zirogianni A, Podschun R, Schröder B, et al. Impaired phagosomal maturation in neutrophils leads to periodontitis in lysosomal-associated membrane protein-2 knockout mice. J Immunol 2008;180:475-82. Tanaka Y, Guhde G, Suter A, Eskelinen EL, Hartmann D, Lüllmann-Rauch R, et al. Accumulation of autophagic vacuoles and cardiomyopathy in LAMP-2-deficient mice. Nature 2000;406:902-6. Huynh KK, Eskelinen EL, Scott CC, Malevanets A, Saftig P, Grinstein S, et al. LAMP proteins are required for fusion of lysosomes with phagosomes. EMBO J 2007;26:313-24. Phattarataratip E, Olson B, Broffitt B, Qian F, Brogden KA, Drake DR, et al. Streptococcus mutans strains recovered from caries-active or caries-free individuals differ in sensitivity to host antimicrobial peptides. Mol Oral Microbiol 2011;26:187-99. Anaya-López JL, López-Meza JE, Ochoa-Zarzosa A. Bacterial resistance to cationic antimicrobial peptides. Crit Rev Microbiol 2013;39:180-95. Kovács M, Halfmann A, Fedtke I, Heintz M, Peschel A, Vollmer W, et al. A functional dlt operon, encoding proteins required for incorporation of d-alanine in teichoic acids in gram-positive bacteria, confers resistance to cationic antimicrobial peptides in Streptococcus pneumoniae. J Bacteriol 2006;188:5797-805. Grangette C, Nutten S, Palumbo E, Morath S, Hermann C, Dewulf J, et al. Enhanced antiinflammatory capacity of a Lactobacillus plantarum mutant synthesizing modified teichoic acids. Proc Natl Acad Sci U S A 2005;102:10321-6.